Since the launch of Plastic-Free Tuesday about two years ago I have been experimenting with plastic-free tools to keep my home clean and tidy. It’s almost Christmas, time to clean up the house to receive family and friends for drinks and dinners. These are my tips for doing the cleaning job with very little plastic. The best plastic-free dish brush is one made of wood and plant-based fibers, has a replaceable head, and is sold without packaging. While you would normally ditch the entire brush in the waste bin, once it is time to buy a new brush, you only need to replace the head. This saves a lot of waste, especially if you cook frequently, have no dishwasher, and thus have piles of dirty dishes to wash. In the Netherlands, I found the most durable brush of this kind at Dille & Kamille, a home&kitchen store that sells most of its products without packaging. It’s heaven for those into cooking and plastic-free living. Organic supermarkets sometimes sell this kind of dish brush too, but I found the quality inferior. Disposable dish wipes might be convenient but are an environmental disaster. They not only come in plastic packaging, but also generate a lot of completely unnecessary waste. Instead, I opt for a washable dishcloth made of organic cotton that comes without packaging. I bought several at the same store I bought the dish brush, Dille & Kamille. Some types of dishcloth contain synthetic fibers. Microfiber dish cloths are usually made from polyester, polyamide, or a combination together with polypropylene (PP). All three of these are plastic. Research has shown that a large share of the plastic pollution in our oceans (“plastic soup”) comes from washing synthetic clothes and items such as microfiber cloth. Make sure to read the labels before buying to make sure it’s not synthetic! We haven’t bought cleaning detergent for ages. Instead of buying cleaning detergent I use vinegar. I just pour some vinegar on a dishcloth and use this to wipe the stove and kitchen counter top. Vinegar excels in removing grease stains. 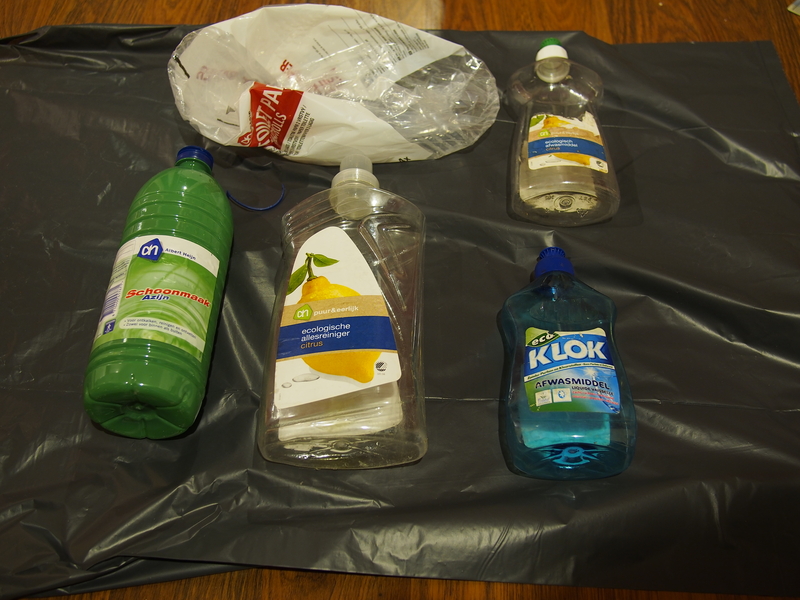 Although vinegar usually comes in plastic bottles (at least here in the Netherlands), vinegar is much better from an environmental point of view and it feels that I need less of it compared to conventional cleaning detergent. While writing this post, Marlies pointed out that Asian supermarkets in the Netherlands sell vinegar in glass bottles. This type of vinegar is very concentrated and so you need to dilute it with water before using it. Marlies just gave me the tip to buy concentrated vinegar in a small glass jar. Asian stores often have it. Great solution! 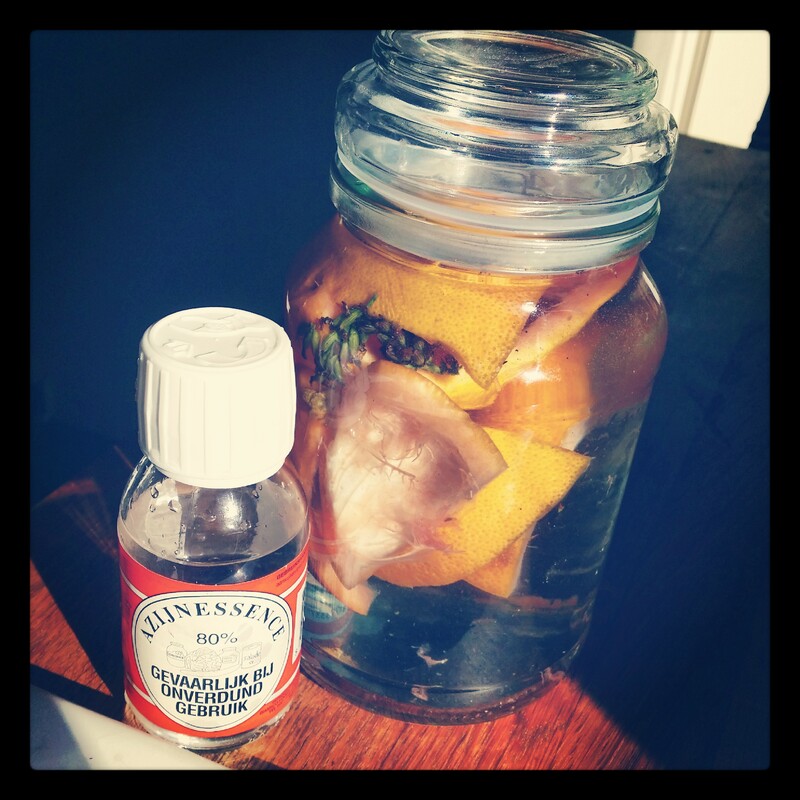 You can improve the smell of vinegar by adding some citrus peels, lavender and/or essential oils. Some foods, for example garlic or onion, leave your cutting board smelly after usage. Other foods, such as meat, leave behind potentially dangerous bacteria. In order to erase any odor and bacteria, I spread some baking soda on the cutting board. I then pour some vinegar on it. What follows is a chemical reaction with bubbles and a sizzling sound. After a few minutes, the chemical reaction is finished. I then brush the cutting board clean and rinse with warm water. The result is a clean and hygienic cutting board, ready for the next meal. I have tried many different plastic-free things for doing laundry. For a while I only used baking soda when washing dark coloured clothes. Worked out fine. 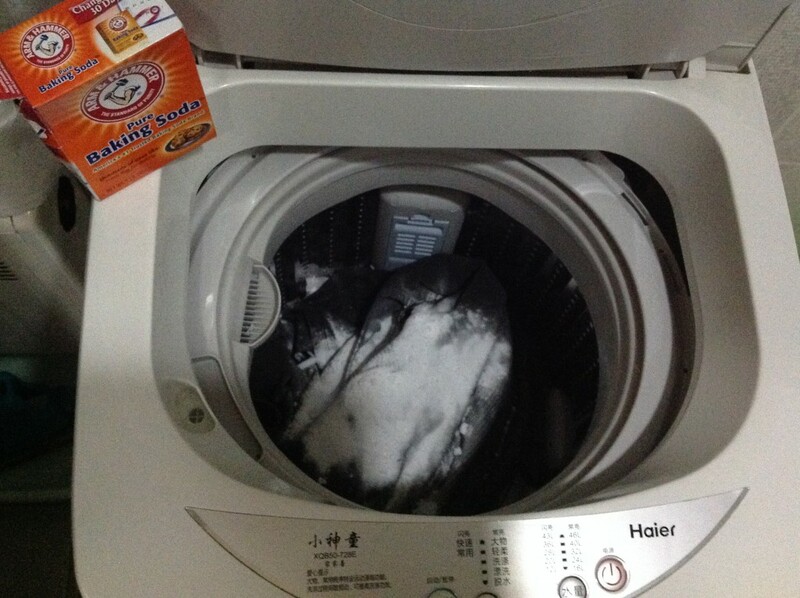 Baking soda works well for smelly clothes, but it is not soap, so it won’t really clean stains. 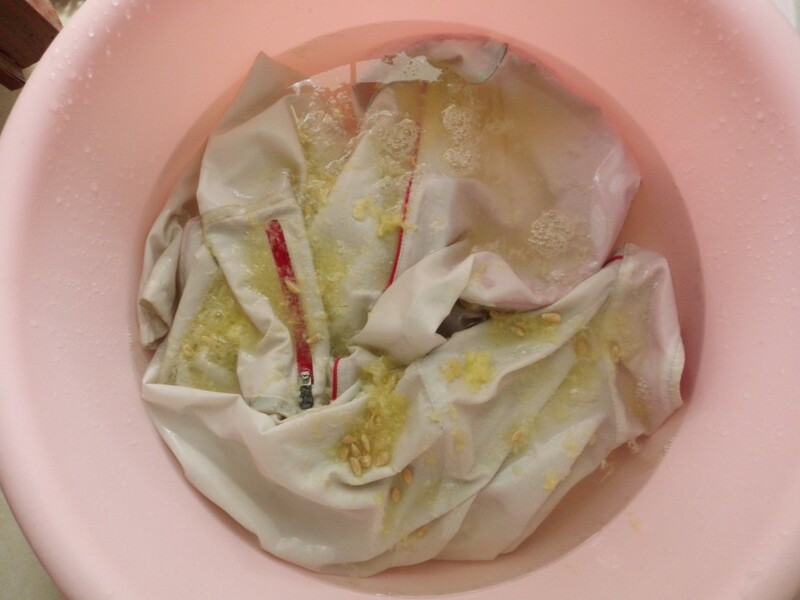 So the baking soda only method is only an option for clothes that may be a bit smelly but not visibly dirty. For white clothes, I use lemon juice. I simply juice one or more lemons, put my white items in a basket and pour the lemon juice over it. I then fill up the container with hot water. The next day, I put the clothes in the washing machine, with some soap nuts and the result is really white, clean, fresh smelling clothes! If the sun’s out, I dry the laundry outdoors. Sunshine has a bleaching effect, which is great for white items. After a while, I came across soap nuts, so I started to use those. Soap nuts come from the Sapindus tree and as such they can be composted after usage. I put 5 or so nutshells in a small cotton bag that I add to my laundry. 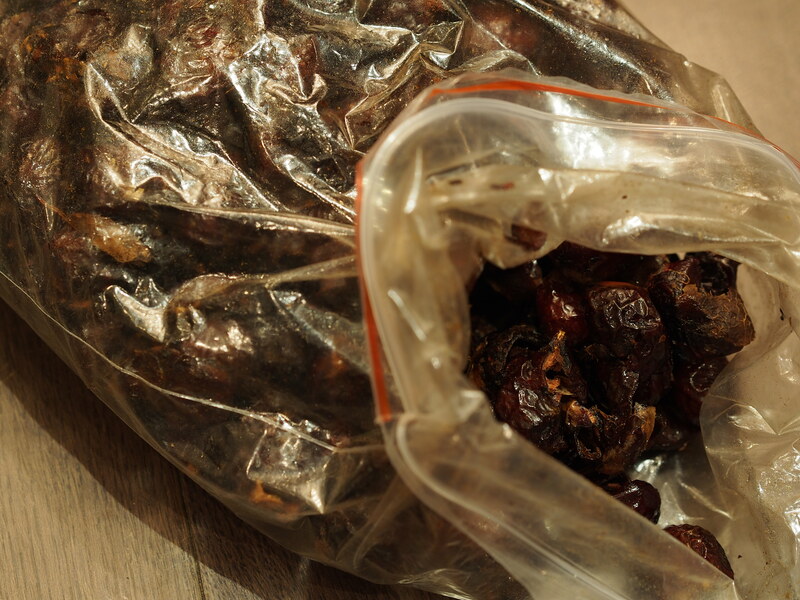 After the machine finishes, I hang the bag to dry and then reuse it 4 times. I was hoping that soap nuts would deliver fresh and clean clothes, but it did not really. Despite pre-treating stains with soap and adding essential oils, I still am not really satisfied with the result. What’s your favorite plastic-free cleaning tool? Ik gebruik dezelfde afwasborstel en vaatdoeken. Soap nuts alleen voor de Bonte was, met een druppel geurolie in het bakje voor de wasverzachter. Vlekkenzeep ook van D &K, ze hebben verschillende soorten zonder verpakking. Essentiële oliën gebruik ik ook als luchtverfrisser en om een stinkende prullenbak te voorkomen (een druppel op een stukje wcpapier onderin). Baking soda en kokend water gebruik ik als gootsteenontstopper. Azijn als toiletreiniger vond ik geen succes, dus daar gebruik ik nu lily’s eco clean voor. Hallo Neeltje! Wat leuk dat je ons blog leest en hartelijk dank voor je berichtje. Lily’s eco clean kende ik nog niet. Voor het toilet gebruik ik azijn samen met baking soda. Die twee samen bruisen eerst een tijdje. Daarna poets ik het toilet met de borstel. Werkt prima hier. Thanks for stopping by and thank you for your interesting comment! I wasn’t aware of this side effect of increased demand for soap nuts. Recently, I haven’t used soap nuts at all. I am using a laundry detergent with the Nordic ecolabel. Your soap nuts are not plastic free? Please do elaborate. I purchase soap nuts online and they come in a cardboard box, no plastic visible. Perhaps there is some other packaging issue of which I am not aware? That´s right, my soap nuts are not plastic free. Here in the Netherlands, I have only seen soap nuts packaged in plastic. The brand that is now most popular, Seepje, uses plastic and cardboard.